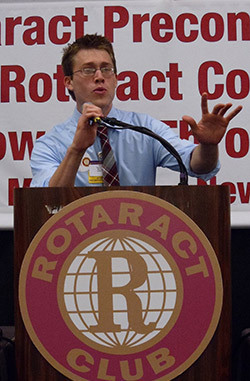 David Postic at the 2011 Rotaract Preconvention Meeting in New Orleans. Baseball is a sport so historically beloved in the United States that it is called “America’s pastime.” Yet few Americans I know actually watch baseball on a regular basis. Why? Because when you really look at the game, it can seem slow, boring, and it can get old pretty quickly. Most people love the idea of baseball; they just don’t love watching it. Similarly, there are many young people out there (like me) who love the idea of Rotary. But when you really look at any given Rotary club it can seem, well, slow and boring. I had the luxury of growing up around Rotarians, so when I see Rotary I see something groundbreaking, something transformational. Yet of all the Rotary meetings I have been to, never once have I heard someone say, “Did you know that, through Rotary, you can change the world?” That is Rotary’s most powerful message, and it is the one young people need to hear. And if they do not hear it, I can guarantee you they will not be engaged in Rotary. The problem boils down to this: there can sometimes be a generational gap in Rotary clubs. There are older Rotarians who see it as a social club and younger people who see it as a retirement home. As a result many young people choose not to join those old clubs and instead form new ones. New clubs are by no means bad things, but when all the young people are creating new clubs the math says those old clubs will eventually die. First, wake up. If your meetings or service projects are not more exciting than going to the mall, watching the latest episode of American Idol, or even spending an hour on Facebook, young people will not be engaged and they will not join. Get out into the community and serve. Develop innovative projects that truly make a difference. Writing checks is not enough to keep us interested. Second, let go of your club. Give up control. People my age want to feel like they are making an impact. Give young members responsibilities. Listen to their ideas. Most importantly, make them the leaders and let them change things. If you make it a habit to continuously evolve as a club, you will continue to engage young people and flourish. And when clubs flourish, Rotary flourishes. It is as simple as that. Rotary is a great idea, and I want to be a part of it. There are millions and millions of young people like me who want to be a part of it too. But as long as Rotary, like baseball, seems to be slow and boring, what reason do we have to join? If you want to engage young Rotarians, wake up and let go. We think that’s awesome. This entry was posted in Empowering youth and tagged Rotaract by Rotary International. Bookmark the permalink. Is the average age of rotary members fast approaching the average age of the members of Probus ? I agree with the reality that young people are not joining rotary,is it time to rethink the basics of Rotary and embrace the social media revolution. The average cost to be a member that meets weekly is about $70 per week(one person not including a partner), for couple thats $140pw.If you asked 100 people to join a club and pay $3640 annually ,instead of weekly.how many would join? and if 100 did join you would have $364,000 . Now for the rules ,4 dinner meetings per year,included in the annual fee (ie 100 @ say $100 per dinner meeting cost ,4 times per year =$40,000 ,) minimum formalitys at meetings, good guest speakers and you have $324,000 to donate to worthy causes. No working at barbecues ,door knocking,all buisiness conducted by social media. I know this concept has much more to consider,and I am sure theres a lot to consider. Thank you for writing this. I am a Rotary member. I hope you don’t mind but I used your blog for another organization that I am a member of. The other organization is also dealing with aging members. Where you mentioned Rotary I placed the name of the other organization. I made sure to give you credit. I used it to end a presentation….it went over so well that other individuals would like for me to share it with them. May I share your blog. It is fine with me if you share this article! Thank you for spreading the message. What a great discussion. I think it is so relevant. Those 2 main points from the original article are so right – about Rotarians doing worthwhile things and letting the new adult generations in – respecting their adult status. In Lisbon a 29 year old professional and Rotarian asked me what I was doing at the same age – asked how I would have responded to being called a “kid” and treated like one. My daughter says that “we all want to be needed and need to be wanted”. Also, I know that I was not invited to re-join Rotary (at 50 and as PE) when I changed job and relocated (along with 4 others who moved on at the same time). It took 6 years for me to re-connect. We all behave differently in this mobile (both meanings)world. I suspect all clubs need an eClub component to meet the needs of all ages! Great conversation, and the type communication that should be encouraged. May I suggest that we all recognize that Rotary clubs and Rotaract are, as Brent points out, member centered organizations that should deliver value to members while they individually and collectively make positive impacts on their communities and the world. I would also like to suggest that those who are interested consider reading Rotary’s Circle of Life at this link http://zone34retentioncentral.blogspot.com/2013/04/rotarys-circle-of-life.html. Each one of us can give an opinion based on the way that our clubs are running and depending on how lucky we are of having an active club. In my case I´m a Rotarian from Guatemala and I have to agree with David that most of our clubs are not attractive for young (35 and down) ones due to the lack of enthusiasm in service projects, even for the simple ones and the loss of good administration or simply not complying with the rules that RI prescribe to our clubs, which by the way, marked a distinction status in our communities. In July 7, 2013 I addressed this issue to our RI president but unfortunately the only answer I´ve got to my has been “We are in receipt of your email and it has been forwarded to the appropriate department for attention.” If any of you you would like a copy I will gladly send it to you. I agree that it is critical for Rotary to be attractive for young people – even people younger than 30. If Rotaract is supposed to be a breeding ground for future Rotarians, they need to have something to look forward to. That response from your president would immediately turn me off. Not because he kept me abreast of the situation but because, in that club structure, there is nothing more I would be able to do to advance my idea. If you can arrange your club to allow members to take initiative, young people will find that attractive. David I just to clarify that the response I have been receiving is from the office of our Rotary International President. Well then I do think that changes the issue quite a bit. My comments are geared toward action at the club level, not at the international, organizational level. Obviously Rotary should know if some clubs are not complying with RI rules, but grassroots efforts to improve clubs in your area is probably the most effective way to solve the problem. As a person who helped start a Rotaract Club it has been very exciting to watch that club grow and flourish. For the under 30 age group to have the opportunity to lead and learn Rotary rather than being swept under the rug at a traditional Rotary Club is wonderful to witness. Rotary will grow some future leaders by giving them the chance to shine young. Is David’s article “in full” available on the web? Can you make it so, if it is not. BTW, since Brent shared his age and station I’ll share a little about myself. I am in my 4th year as a Rotarian. I was sponsored by a 35 year old president at the time. This year I became the oldest president the club has ever had in its 72 year existence. I am 74. I am also into year three as Communications Director for the District. David, you are speaking to a North American issue but the problem I believe is also a factor in Great Britain and Ireland, the EU, & NZ-Australia,is it not? John: From all your comments on here, I can tell that you are the type of Rotarian I love to hear about. When I say that its not age that is the problem, you are the perfect example. While I can only speak intelligently about the problems I have encountered in North America, in speaking with my friends in Australia and GB&I, I do know that similar problems exist elsewhere. Actually, I would venture to guess that the problem exists everywhere. I agree that Rotaract is a great transitioning organisation. I would never have joined Rotary at all if I hadn’t had 7 years in Rotaract first. However on the age difference issue I have mixed feelings. I joined Rotary at age 31 and the member next in age to me was 46 with most being 50+ and some 80+. This was how Rotary was and I just got on with it. That was over 20 years ago. I wonder whether some Rotaracters or people of Rotaract age are less resilient than we were, or have an unreasonable expectation that they will be able to join a club which has lots of members at the same age as they are? Your average Rotary Club often has multiple projects that don’t even make the local news; they are not as boring as baseball (and I think baseball is great all round entertainment). Paul: Baseball is actually my favorite sport. My problem isn’t that I am not interested in Rotary, it is that I have trouble sharing that interest in Rotary. This goes along with the image issues mentioned above. I have no misconceptions about age in Rotary. Considering I am 22 years old, I can reasonably expect that everyone in a Rotary club is going to be older than me (and many will be VERY much older than me). Nevertheless, I feel that I can make friends with 70 year olds just as easily as I can with 30 year olds. At the Lisbon Convention this June, I had wonderful conversations with Rotarians and Rotaractors of all ages. Age is not the problem. Sometimes, however, clubs simply begin to feel “old.” Not because they have a lot of old people but because they have a lot of old projects, old meetings, and old atmospheres. The key to maintaining an energetic and enthusiastic club (which will attract more young people) is to evolve and allow new opinions to be heard. You don’t have to make every young Rotarian president. But you should listen to every young Rotarian, and you should give them opportunities to have responsibility. In many ways I take exception to your comments. You description of Rotary clubs today is insulting and not passing the four way test. I find the generation gap more to the two words givers and takers from old to new. I don’t see a reason for anyone to take exception to what David is stating as his opinion, even if we do disagree. Your view maybe different but ithink his views are probably what younger people feel. And if younger people feel that way we have to do work to overcome that perception if we someday hope to turn Rotary over to people who will keep it going. After all, perception is reality and,as the Siegel andGale report shows, we have a lot of public image problems to overcome. As for the substance of what David says, it is obviously unrealistic to expect to be handed the keys of a club and I don’t think he meant that. However in my experience as a PDG and Zone Membership Coordinator his points about wanting to have input and be able to participate in projects that are meaningful to the members are spot on. It is lacking in most clubs. And that is why the North American Membership Plan calls for providing members with the value they seek from Rotary as the key to retaining members and growing. We can solve out membership problems if we engage in productive discourse and exchange ideas like David is generous enough to share with us. We don’t move the ball forward by engaging in name calling or complain about being insulted. That attitude is just not Beneficial to All Concerned and certainly doesn’t Build Goodwill and Better Friendship. Paul: I apologize if I insulted your view of Rotary. As an aspiring Rotarian that is not what I wish to do. As bdrdg2011 said correctly above, I am merely wishing to start a conversation. That being said I would be interested to hear how your club handles the issues I bring up. I am always open to new ideas that can help improve Rotary and Rotaract in my district and in others. Really great article and really good comments as well. I am a member of the Rotary Club of Centurion in South Africa, and I really think the club goes a long way to be in line with the above two ideas of being out there and doing things as a club, getting community buy in and getting involvement regardless of age. The club ranges in age from late twenties to mid-seventies because of it, and while we are a small club, we are a tight-knit club. Small clubs are some of my favorites, so I am glad to hear that things are working well for you. What is the age range of your members? And have you ever had problems with older members having trouble passing off responsibilities and leadership to younger members? Our age range is from 29 (myself) to ~74, with the average age around the 50 or 55 mark if memory serves from the last AGM. I am a recent member, and can’t say I’ve noticed any hesitation in leadership being delegated (I am currently head of PR and Communications for the club). I think the club members from top to bottom really embrace the objects of Rotary and the recognition of the ideals of service, and if you are willing to step up to the plate (excuse the pun), you’re good to go! In short, everyone mucks in on the playing field. Excellent points. Getting younger members involved really brings life to the organization. Older members might consider including members who didn’t graduate from the same high school they did 40 years ago in the leadership of their clubs. A fairly new Rotarian with the most amazing background, education, carreer, political connections and sense of humor is barely noticied by the old boys in his club. They are so busy visiting among themselves they hardly speak or try to include a new member in their circles. We’re all quility and need to do better. E-CLUB ONE in the US and are now a world wide new way to serve as a Rotarian. I know some people in E-Clubs who love it, so I definitely see them as fulfilling a wonderful role in the ever-expanding world of Rotary. But I also believe there is a lot to be said for being physically present with one another — especially when you are talking about intergenerational contact. To me, those intergenerational friendships are some of the most valuable things Rotary offers. Electronic communication is the way we live but there is nothing more contagious than a face to face conversation. We need to make Rotary more contagious! I have this idea I want to try. Rather than create a new e-club I want to create a satellite m-club. I haven’t taken it to my executive yet (I’m president this year). I call it an m-club for mobility. It is based on a smart phone. The idea is that the person joins a club and pays full dues, but the person doesn’t have to attend the weekly lunch meetings. It is aimed at the young family professional. They stay in touch with each other, can meet when and as they please with other M members or traditional members. They become available to work on projects and take on a responsibility like all other members. Rotary took off the limit to e-clubs, this combines features of a satellite club.and an e-club. It could even evolve into a club or members could, to use your word, “transition” into the regular club as their responsibilities and resources changed. John: I think that any idea is worth pursuing if it can bring Rotary to more people. Rotary has been making changes to its e-club policies for a reason. However, when it comes to young people in particular (the only demographic for which I can to speak intelligently from experience), we must be careful with HOW we expand Rotary; does this new direction maintain the friendship and fellowship that membership in a traditional Rotary club offers? If you start such an m-club, I would love to hear how it works for you! David, first your piece is the kind of thinking I would like to see more of at Rotary Voices. Unless we engage in debate we will never improve Rotary. So well done. However, I find something incongruous about you as a representative of Rotaract talking about Rotary. We agree, we both want young people in Rotary but young people can’t be in Rotary and Rotaract at the same time. Wouldn’t it be better to have young Rotary clubs and old clubs if mixed aged clubs were impossible in some localities. Also I believe Rotaract was formed when the rules regarding attendance, meetng format, and classification were much more rigid than they are today. I can’t help but think when it comes to young people, because Rotary has become much more flexible, that Rotaract is now a competitor to Rotary for membership. John, you bring up a valid point: if mixed age clubs are impossible, then of course any Rotary club is better than none. But I don’t view Rotaract and Rotary as natural competitors. Rotaract is the perfect organization to allow young people to transition to Rotary, and it should be seen as such. There is a reason the upper age limit for Rotaract is 30. That gives young people enough time (on average) to advance far enough in their careers and have the time, money, flexibility, and connections to make a significant commitment and contribution to Rotary and the community. The problem, in my experience, is that Rotaractors don’t often make the transition to Rotary because of the reasons mentioned in my article. My solution is not to fundamentally change Rotary at all; I simply want to call on Rotary clubs to be aware of this generational gap that exists and to adjust accordingly. I am very glad that finally someone comes here and says exactly what I feel happens in my club. Some of the members live in the past. Time as changed we have to be active, creative and adjust ourselves to today’s reality. In your opinion, is Rotaract a function of larger cities. is it practical in communities between let’s say 5000 and 10,000 people. These tend to be one Rotary club towns. Would it not be better for the Rotary club to be revitalized by bringing successful, ambitious 20 somethings into the club directly rather than a two or 3 member Rotaract club? I want to comment on another point you make and that is asking the old folks to step aside. You reference the club. I would reference RI at its most senior levels. If a 30 year old Rotaractor can’t see the top of the ladder for 45 years why would he/she join. During Rotary’s first 20 years the average age of its President was 45 . During the past 20 years the average age has been 75. Should we not look at some of the systemic barriers which have developed within Rotary to cause this to happen? John: I think that is definitely an important issue to consider and frankly I don’t have a good answer. It depends on the situation. If you have a one-Rotary club town of 3,000 people, but there are 50 18-to-30 year olds who are very interested in Rotaract, then of course a Rotaract club makes sense. However, regardless of the size of the town, Rotary clubs should consider ways they can better accommodate younger members. In reference to “seeing the top of the ladder,” I am by no means asking the older Rotarians to step aside entirely. Quite the opposite. The reason I am expressing these opinions is because I want young Rotarians and old Rotarians to be able to work together side by side for the good of Rotary. The problem we have in many clubs is that the older Rotarians simply run the show without yielding much input to younger members. I do think you are right that we should look at some of the systemic problems inherent in many Rotary clubs (e.g. the tradition of establishing a “leadership track” of sergeant-at-arms, secretary, director, President, etc. ), and I would be interested to hear about similarly-themed problems that clubs have in common.